This morning, folks here in the Delaware Valley woke up to the news that the Philadelphia Inquirer will shortly have new owners. I won’t get into any details about the sale or the bankruptcy or the current owners, because frankly, it all confuses even me. All I know is that Brian Tierney and Bruce Toll bought the paper for more than $500 million a few years ago. About a year later, they declared bankruptcy claiming that they had too much debt to service. Somehow, it all headed for the auction block, and they just lost it to some new guys who got it for a winning bid of $139 million(!) I’m no finance genius, but — holy crap — what a lousy investment that turned out to be. Whatever. I only care about what’s going to happen to the paper itself, and using history as a guide, I have a sneaking suspicion that the coming changes won’t signal a whole lot of improvements to the product itself. You won’t find a bigger fan of newspapers than me. I can probably describe myself as part of the last generation that regarded the paper an important part of their daily existence. Walking up and finding it on my doorstep made for the perfect compliment to the aroma of my coffee brewing. What else would you want to take into the bathroom with you to read? For these forty years, I would read the paper in much the same way every day: Comics first, Ann Landers (and her successors), entertainment, and then on to the hard news. With a cup of fresh hot coffee by my side, life was good. In 2000, the I saw how my world would soon change. One morning, I found myself reading the Boston Globe on my laptop via the internet while the printed version remained outside my front door. When I realized what I was doing, I immediately saw some big trouble for the industry, and I hoped that they had prepared for it. They didn’t. Even in that year, after more than a decade of declining circulation caused by other factors than the internet, the newspaper industry enjoyed some hefty profit margins. I kept reading the margins ranged from 20 to 40 percent in some cases. Even during that period, my paper kept getting smaller, kept jettisoning long-time features, and in some markets, became mere advertising platforms within a larger corporate chain. Local ownership of the daily paper became a quaint notion. Then we saw the internet explode. Most papers had online versions, but none — except for the Wall Street Journal — seemed to have a business model geared for this new reality. Most of us know the rest of the story. 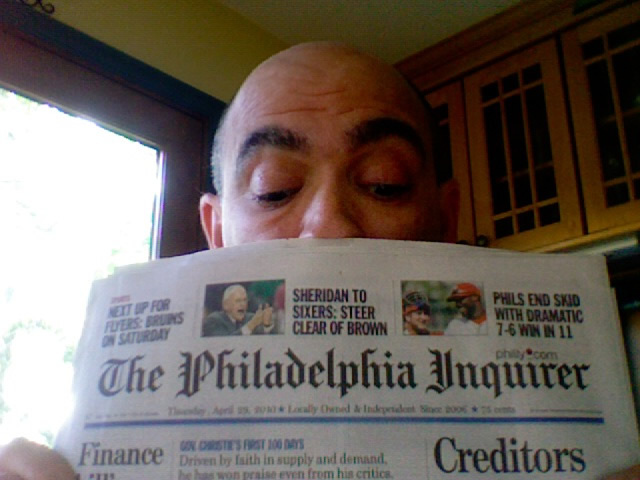 When I moved to the Philadelphia area, Louise and I immediately signed up for a subscription to the Inquirer. At that time, the paper still had some heft to it. On Sundays, it still had its color magazine, and a twelve-page color comics section. It featured national and local columnists, and a whole page in the local section for guest commentary and letters that dealt specifically with local issues. And it had great ads, the big stylish department store ads from a variety of stores. They had already shrunk the physical size of the paper by the time I got there, being one of the first major dailies to do so. Then they fiddled with the magazine, rolling the TV listings into it. Then they dropped the local guest column section. Then they pared down the Living section. Then they shrank the daily comics even more. Not even Doonesbury could escape the shoehorning. Then they dropped the magazine, and replaced it with a newsprint “Image” section, which they also axed about a year later, rolling that content into the Tuesday Living section and called it “Style and Soul.” Then the Saturday paper dropped the advice column entirely, and they stuck the entertainment section in with the business section. And finally, they killed the separate Sunday comics section, and rolled it into the TV listings, which even further reduced their size. I fear that this news of new owners means even more cuts, reductions, and general cheapening of the product, for which they will likely charge more. If the auto industry had followed this approach, Ford would be selling Model Ts again, albeit in a range of colors. To the new owners of the Inquirer: If you strip any more value out of my newspaper reading experience, if you go ahead and fire large chunks of the staff, if you strip one single comic (except Peanuts or Hagar) from the funny pages, it’s over. I will break it off. After forty years of taking advantage of my devotion, I will have had enough, and I will say good-bye forever. I’ve finally concluded that the newspaper industry, like so many others that have lived fat and happy for so long while enjoying a position of major economic and societal prominence, is run by utter boneheads who wouldn’t recognize a golden opportunity if it crushed them like a full roll of newsprint. This is an industry that deserves its fate and in no way do I support any kind of government bailout, financial, legal, or otherwise. Ending this relationship will not come easy, but I can already find most of what I want to read from other online sources, including the comics. I hope that the new owners look at this as an opportunity to not only make some money, but to begin rebuilding a once-great brand within a once-great industry.